An Irish-themed slot for the ages trust us! Those of you out there looking for a slot that takes you places will no doubt find all the fun and excitement that you’re looking for in Barcrest’s very own Rainbow Riches, a slot with a lot of upside for being based on a theme that has basically been done so many times within this industry. What can we tell you about Rainbow Riches, well we could tell you that this is a 5 reels slot that features 20 pay-lines as well as 243 different winning combinations for players to pick from. There are various additional features here that pad out the rest of the slot here at ThorSlots, but for now lets simply summarise. Like most online casino slots nowadays, the ability to reach multiple demographics is the desired effect, and in Rainbow Riches players will find that they can play this slot anywhere and at anytime due to the ability to play this slot on mobile as well as desktop devices. The action will never stop rolling if you do so desire in Rainbow Riches! There is a very fun jackpot element to Rainbow Riches also that allows players to aim for the highest of highs in terms of scores. The RTP of Rainbow Riches is very generous too, giving players a very hefty 95% RTP to contend with. It’s moments like these that make you stop to think how fun online slot gaming is. If you still aren’t convinced that Rainbow Riches is the right slot for you, then why not check out the rest of our written review below. You might just learn a thing or two in the process! We are going to be frank, we are so sick and tired of Irish-themed slots that when we get a chance to review them, we are just so burnt out by what we experience. There is very little in terms of creativity being used in these slots, the only attention is paid to the art style and even then this is very lacklustre in many different instances. 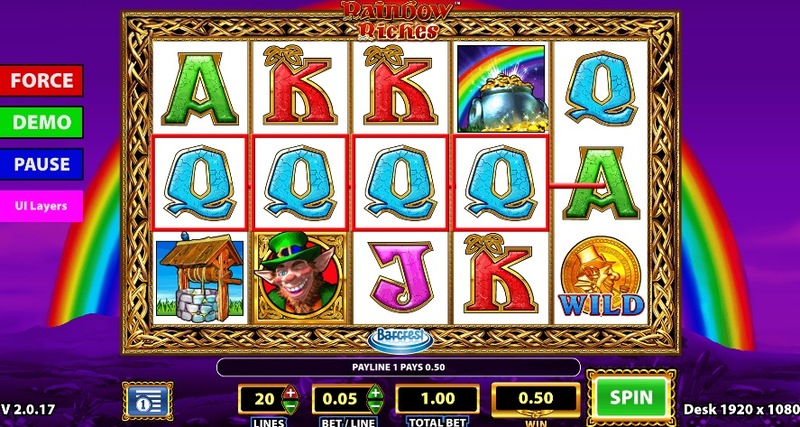 Rainbow Riches is a very welcome change in direction that we never truly expected until we played this slot out for ourselves. You obviously hear stories about slots being greater than expected, but not once did we consider Rainbow Riches to be the slot to potentially change our minds on Irish slots moving forwards! 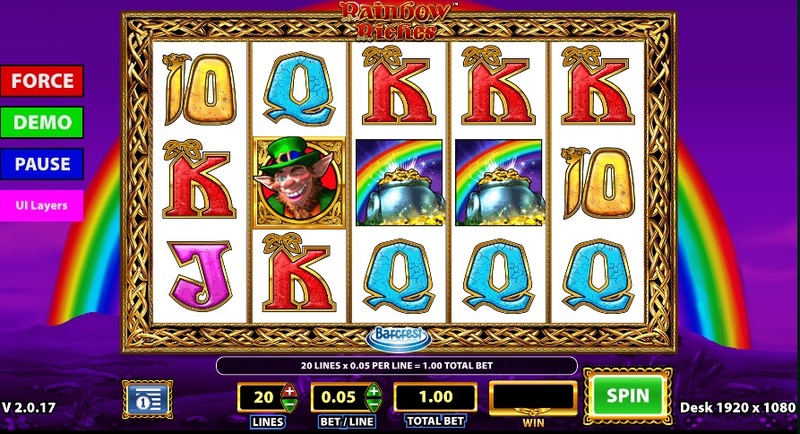 Rainbow Riches is a very simplistic slot to grasp compared to other slots that are currently out in the market. If you’ve played any other Barcrest slot before then you should expect much of the same with this one. Symbols are matched in the traditional left to right formation, and symbols can be matched from as little as combinations of 3 to around 5. The more symbols one matches the higher the score, and certain symbols on the reels will have a higher score than others which gives players something to aim for when on these reels. The look of this slot is rather plain compared to other slots out there, but that’s to be expected considering technology is moving at such a rapid pace. Before one begins to spin these reels they must set their starting bets, these bets can be placed from as little as 0.1 to around 20 per spin, making it very easy to see why this slot is so popular in the industry as anyone can play! The reels are populated with a mixture of high and low value symbols, all of which offer variations to classic combinations. Each symbol is clearly outlined by its colour and the character on the symbol itself. We would advice famiiaring yourself with the pay-table before each and every spin to make sure you are aiming for the right symbols, but we find that playing blind is also a very valid technique. If you do choose the latter then there is a pay-table button at the bottom of the screen that allows one to view the pay-table accordingly. You thought that this slot was holding out on you in terms of additional features? Boy how wrong you were. Rainbow Riches is packed to the brim with additional features to keep those reels rolling. Playing the most possible spins will grant players access into these various features, although some simply appear in standard play. WILDS: The golden coin symbol is Rainbow Riches chosen wild symbol, and will allow players to substitute for various other symbols on the reels aside from the scatter whenever this symbol is matched on the reels. Players will also earn 10,000 coins when matching 5 wilds in a winning combination. ROAD TO RICHES BONUS: Landing 3 or more leprechaun symbols will grant players access into this feature. This feature offers players the chance to enter a mini game where they must match symbols in order to earn additional multipliers. Make no mistake about it, Rainbow Riches is here to stay: a slot that is full to the brim of additional features and great gameplay. You’d be a sucker to miss out on a slot like this one trust us! Play Rainbow Riches today! Or you may also like Irish Eyes!